The Silentaire Val-Air 50-24 AL is one of the best professional grade air compressors presented by Silentaire Technology. Throughout half a century the company delivers quality and reliable HVAC equipment and that is why it has become the leading manufacturer of quiet air compressors in the industry. A large team of qualified and ambitious Silentaire specialists is involved in the process of design, engineering, and manufacturing of these air compressor units. They constantly work on the creation and implementation of ultimate solutions to provide customers with highly efficient devices and optimize compressors for their needs. For that matter, all Silentaire compressors are developed with due regard for the convenience and simplicity of operation. To make work with their compressors even more enjoyable, the manufacturer uses only quiet yet powerful technologies. All that has earned trust and excellent reputation of the company among many customers around the world. If you have been given a choice between heavy-duty and silent compressors, what would you choose? We think that this question has lost much of its relevance with Silentaire compressors from the Val-Air line. These are very quiet and completely automatic, all while each Val-Air compressor comes equipped with one or more powerful 1/2 HP "AL" motors. For optimum performance, such "AL" motors feature aluminum heads and cooling fins. As for the automatic operation, this means that such compressors require less control over the air pressure within the tank. Due to a pressure switch, the motor automatically stops and starts as the pressure rises and drops to its min and max values. So, with a Val-Air compressor, you won't have a need to check the pressure all the time. Just leave it upon the compressor and enjoy working with your airbrush. 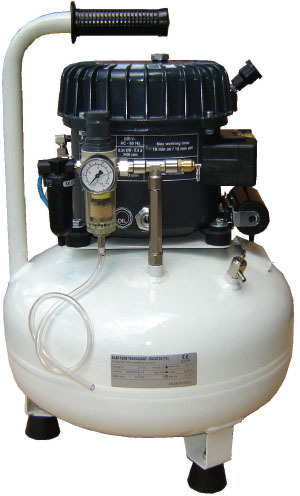 a handle to make carrying and transport of the compressor easier. This Val-Air 50-24 AL is one of the professional compressor models from Silentaire Technology. Due to oil lubrication, it provides a continuous operation along with an optimal functioning for smooth and uniform application of various art mediums. Besides, this compressor is built so that you can move it around and use it in multiple places. Along with that, the packing includes an oil bottle type ROLOIL - SINCOM/32E, instruction manual, and a tank certificate. The Val-Air 50-24 AL offers a 1-year manufacturer's guarantee that becomes valid from the date of purchase. This covers a free repair and replacement of defective parts of the compressor if the manufacturer recognizes them as such. But under the terms of this guarantee, you are not eligible for free repair or replacement of the electric parts and worn compressor parts. Besides, the guarantee ceases if there is any evidence of tampering or bad usage. Therefore, we strongly recommend you not trying to repair it by yourself.